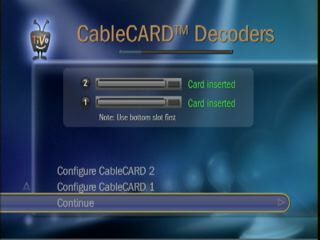 A CableCARD is a device that allows third party hardware (like TiVo DVRs) to decrypt scrambled channels on a cable TV account. The card is serialized, and the cable company instructs the card to unlock the channels for which the provider pays. The card resides in a DVR or a TV, and essentially bypasses the older method of using an entire cable box to unlock these channels. Therefore, this is a real step forward. Eliminating a cable box means one fewer piece of equipment in the mix - one less remote, fewer cables, less wasted time. And, with a TiVo, a better viewing experience. The technology of the CableCARD has generated a lot of interest among TiVo users. CableCARDs have enabled end-users to get the content they want on the hardware they want. And without the dreaded cable box. Just as a web browser enables users to see internet content in a variety of ways on a desktop, laptop, PDA, or phone, CableCARDs allow users to view and record content on their choice of equipment, including TVs and DVRs. Some quick background: the Federal Communications Commission (FCC) requires that all cable providers in all 50 states supply CableCARDs when requested by subscribers (you can see some info about this on the FCC website - they call the technology "plug and play"). The FCC has allowed these cable companies to wire each and every home, so they're regulated as part of those agreements, and the CableCARD standard has evolved from those regulations. At this point, the FCC doesn't (and probably can't) require satellite broadcasters (DirecTV and Dish) to adhere to CableCARD rules due to the inherent differences in broadcast mechanism. The standards for the CableCARD product are evoloved and maintained by a group called CableLabs. But for cable users (digital, analog, and even fiber optic versions like Verizon FiOS), these are mandatory upon request. A CableCARD is really just a chipset housed in a metal case that's about the dimensions of a credit card, and about three times as thick. Each cable provider can have different chips inside, but the key is that there is a descrambler in there, just like in earlier cable boxes. There is also a serial chip in there that holds an electronic serial number. That way, the cable company can link the serial number to your cable account and then tell that specific cable card that you pay for a certain set of channels, and to decode or unscramble only those. So in essence, it's an unlocking device that can be controlled, in part, by the cable company. Once the CableCARD is installed in your equipment (TV or DVR generally) then the equipment requests a certain channel and the CableCARD supplies it. As you change channels, the card follows along with the new requests. The best part is, this is totally seamless. You never have a cable box that didn't get the message - the hardware is completely integrated. The interaction between TiVo DVRs and CableCARDs is truly a great step forward for DVRs. Two TiVo units - the TiVo Series3 and the TiVo HD - can both use CableCARDs to get their programming. If you've used a cable box (or any set top box) in conjunction with a TiVo, this a significant advance, because you now only need one box instead of two. Since the TiVo doesn't have to control a separate box, all of the attendant issues (cables getting moved, IR interference, the box switching off unexpectedly, etc.) are eliminated from the setup. A new type of CableCARD is emerging that can decode two streams of encrypted cable signal at once. These are knows as M cards or multistream cards. With an M card, one card is sufficient to allow a compatible DVR to record two separate channels at once. Currently, only the TiVo HD is compatible with this feature of an M card. A Series3 TiVo can use an M card, but only to record one channel at a time. So for a Series3 unit, you'd need two M cards installed to have the ability to record two channels at once. If/when the Series3 units can receive two streams through one M card, notice should be posted on the TiVo M card support page. While the CableCARD technology is a great advance for TiVo users, there are a few drawbacks. The most important is that current support in TiVo DVRs for CableCARDs is limited to one direction: downstream. They can't send signals back to the cable company. This means that Video On Demand and PayPerView cannot be initiated from a TiVo with CableCARDs. But if the programming is unlocked on the cable account (by phone, online, or from a cable box on the same account) then the TiVo's CableCARDs will generally be able to view and record those shows. One other important note is that neither DirecTV nor DISH make any type of CableCARD, nor are they expected to. Since the FCC doesn't regulate satellite broadcasters in the same way, and since their technological infrastructure is very different, we don't believe that we will ever see this technology for use with satellite broadcasts. Initially, when CableCARDs were first released and the first TiVo DVRs to accept them hit the market (late 2006), cable installers were new to the technology. This caused a fairly large amount of problems for customers. But the installers have gained knowledge of the technology and problems have subsided. A good resource for CableCARD installation is on TiVo's site.